Kaitlin Bennett, a 22-year-old born in Zanesville, Ohio who is pro-gun often brags about “carrying” as in being loaded with a gun. 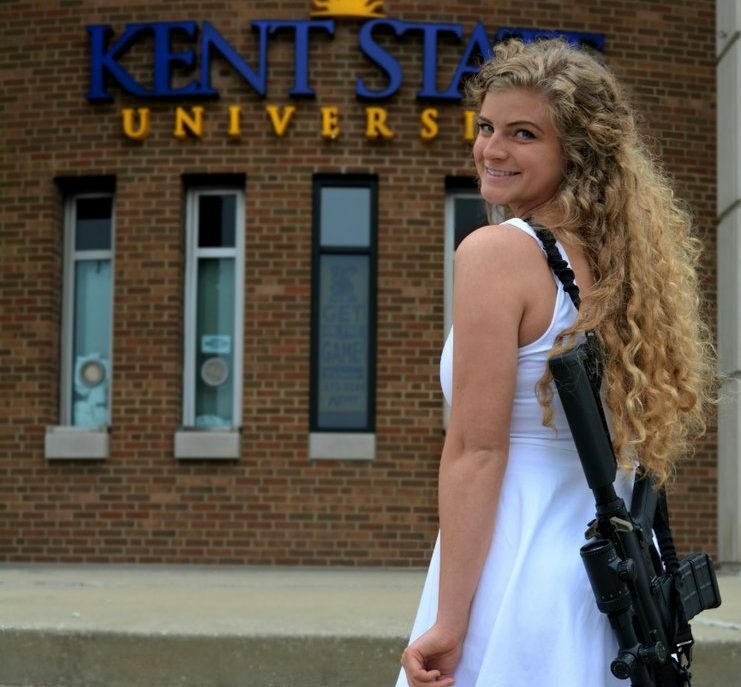 She recently graduated from Kent State University and took a picture with a rifle on her back which got a lot of attention on social media. Her picture got thousands of retweets and tens of thousands likes as it surfaced throughout twitter. Some people thought her action was inappropriate but others thought what she did and her opinions were right. Her cap had the slogan “COME AND TAKE IT” decorated on it. The slogan is historic, dating back to the Revolutionary War and the Texas Revolution against Mexico. Bennett believes due to recent school shootings, it should be allowed for students to carry protection rather than improving guns laws. Why would she post such content knowing victims involved in school shootings are still recovering? It seems as if she’s mocking the situation by portraying weapons continuously when weapons were the root of the problem. A lot of controversy also arose because people believe the act is proof of white privilege. People tweeted that if Bennett were a person of color, police would be all over the picture but since Bennett is white, she only received fame out of it. It’s agreeable why people would think she has white privilege. Her actions shouldn’t have received the attention it did, it just creates more anger because of her ignorance and privilege. What the government should do is create stricter gun laws to make it harder for young people to get a hold of them, not make it okay for us to carry them around campus. Bennett’s pictures and opinions are nothing but a joke, she doesn’t deserve all the retweets and attention, even in the negative way. She should’ve just been ignored and brushed to the side. Sheesh. The slogan is historic, dating back to the Battle of Thermopylae, in 480 BC. We have a problem with guns in schools because our stupid laws prevent righteous persons from possessing guns in schools, and do nothing to stop malevolent persons from taking advantage of this fact. Schools get shot up precisely BECAUSE schools are (phony) “gun-free zones.” All but two of the spree shootings since 1960 have occurred in gun-free zones, where law-abiding people are disarmed by law. At Stoneman school, Coach Feis, a concealed carry license holder who was forbidden by law to carry on school grounds, died heroically shielding students from bullets, while police dithered outside, afraid to enter. If schools were not designated as “special rights-free zones,” he might still be alive, as might many of his students. People who defend this stupid law are directly responsible for the continuation of these shootings. Consider: The average number of people killed in mass shootings when stopped by police is 14.29. The average number of people killed in a mass shooting when stopped by a civilian is 2.33. And although roughly 2 percent of those involved in civilian defensive shootings are innocents misidentified as criminals, for police this number is 11 percent. Strangely, the solution to this crisis is to allow law-abiding citizens to retain all their constitutional rights in all circumstances. Funny how that works out, but entirely logical. I was wondering what you meant by “improving gun laws”? Making it harder for young people to purchase guns won’t solve anything because people with bad intentions will turn to other means to get the weapons. Weapons are not the root of the problem, it is the mental health crisis that we have in this country; you can’t blame an inanimate object on killing many people, its the people and what we see is that these people have mental issues. Weapons are not the root of the problem!